Riding a bike in DC can bring you sights you might never see. There were scores of pictures from my #bikedc friends and me of cherry blossoms this week. Yesterday morning I rode Big Nellie so that I could get a better view of the bald eagle nests on my way to work. At the Tulane nest, I spotted a bald eagle as it hopped out of the nest and perched on an adjacent branch. I pulled over to get a picture but by the time I had my camera ready it flew away. One flap, two flaps and off it went banking hard to the right into the thick of the trees along the trail. It banked left, then right again swooping among the trees. It put on quite a show. The rest of the way was just one fine ride to work. It’s that time of year. After work I rode through the city to meet up with a friend for a beer (or four). I was a little freaked out about the prospect of riding Big Nellie in rush hour city traffic, especially in light of the fact that the Speedplay Frog cleats on both my cycling shoes are worn out. I managed to clip and unclip without incident but I did nearly get doored from the left side. A passenger hopped out of a car into the bike lane I was riding in. Had I been a second or two slower he’d have hit me with the door for sure. I met up with Katie (@flyingovertrout on Twitter – don’t ask) at the Right Proper Brewing Company. It was a nice night so we sat outside at a picnic table. Katie had her back to the Howard Theater next door to Right Proper. Some sort of event, perhaps a fund raiser, was being held in the theater. Limos kept pulling up and the rattle-your-jewelry crowd was popping out of them. Then I look up and there is Colin Powell with Alma, his wife. They posed for a formal picture in front of a backdrop in front of the theater. Katie and I had fun swapping stories about random encounters with famous politcians. Fun fact: our national leaders buy TVs and drink alcohol just like their constituents. I took the empty Madison Drive along the mall to 15th and the Washington Monument. Soon I was cruising around the Tidal Basin and on to the 14th Street Bridge. Once in Virginia I had the treat of riding in the dark on a 60 degree night with the Mount Vernon Trail nearly all to myself. Today’s ride featured no bald eagle sightings on the way to work. I did notice that the big birds that were hanging around the Belle Haven nest had white bellies which means they are probably ospreys not eagles. 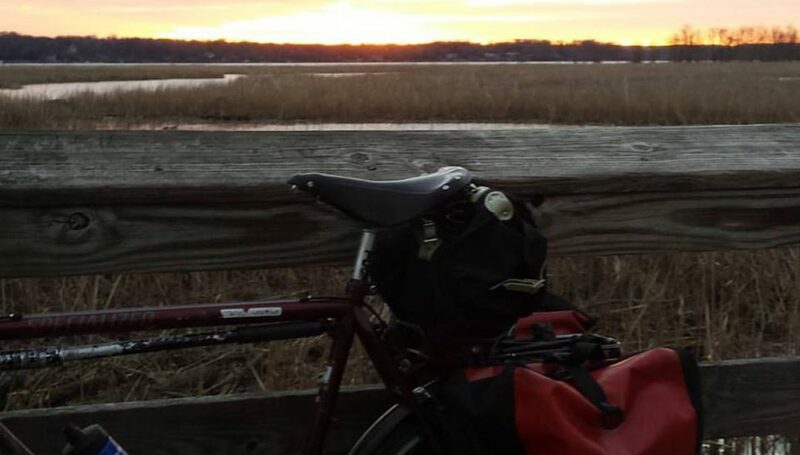 It was so nice out in the evening I did two loops down to Hains Point in DC on the way home. After my little diversion I rode south on the Mount Vernon Trail where I passed the year’s second northboung bike tourist. In Old Town, the bike advocates were out reminding cycists to stop at the intersection of Union adn King Streets. Unlike the other day, I managed to unclip and avoid embarrasment. At the Tulane nest I stopped to check out the back end of an eagle. It was sticking out of the edge of the nest, flapping from time to time. Unlike the Powells, he refused to pose for pictures. As I watched the Nationals game, I replaced the cleats on my bike shoes. Maybe now I can ride without fear of an Arte Johnson moment. I still think its fun to see random famous politicians on the street in DC. I guess I haven’t been here enough for that to lose it’s charm. Then again, maybe it’s because I’m not in the biz – when I worked in theater in NYC, seeing famous actors out and about lost it’s charm when you or someone you know worked with them.